It is a fact that the Emperor penguin (Aptenodytes forsteri) is the largest of all penguin species. The average Emperor stands about 45 inches tall (almost 4 feet) and can weigh up to 90 pounds. The male and female are similar in looks. They have black feathers on their back, white feathers on their underside with some yellow on their upper breast, a patch of yellow feathers behind their eyes, a black bill with a yellow-orange streak, and black, webbed feet with claws. The feathers on these flightless birds are waterproof to help keep their skin dry. Each year, they will lose old feathers and grow new ones (molt). To help keep them warm, they have a thick layer of blubber under their skin. The Emperor is one of only two penguin species that live in Antarctica (the Adelie penguin is the other). They live on open ice and spend time in the ocean. The environment can be extremely harsh during the winter season. 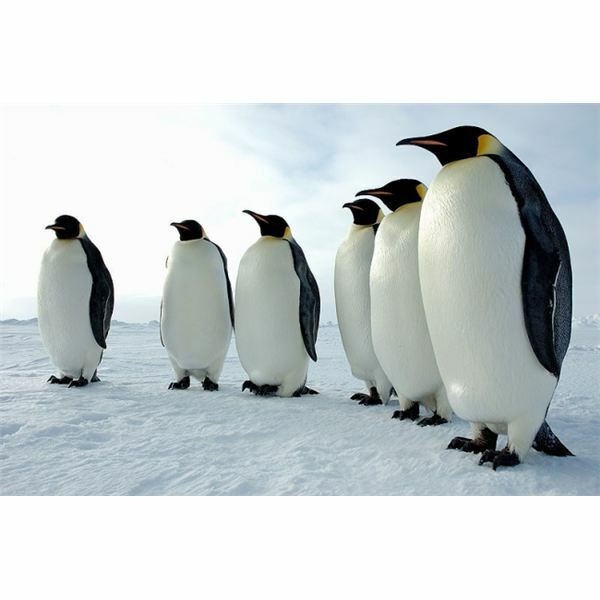 Daylight can be less than 4 hours a day, winds can reach above 100 mph, and temperatures can get as low as -76° F.
Emperor penguins feed primarily on fish, squid, and small crustaceans. They can dive to depths of 1000 feet in the ocean (where there is little to no light) in pursuit of prey but most of the time they only go as deep as about 500 feet. Therefore, most of their dives last about 3-6 minutes. Deeper dives can last up to 22 minutes. Unlike the Adelie penguin who breeds during the summer months, the Emperor penguin breeds during the winter months. The female lays only one egg per season. If something was to happen to the egg, she will have to wait till the next season. Once she lays the egg, she will pass it over to the male. This is a delicate transition because if the male does not scoop it up quick enough, the egg will freeze. When the egg has been handed over, the female will go in search of open ocean water (that has not been frozen over) to hunt prey. Sometimes, she may have to travel up to 50 miles. The male will keep the egg warm during the incubation period by balancing it on his feet and covering it with a warm fold of feathered skin called a brood pouch. During this time, the male mostly sleeps and will not feed. By the time the egg hatches (about 2 months), the male Emperor will lose about 1/3 to 1/2 of his body weight. If the female does not return by the time the chick hatches, the male can produce a white secretion ("milk") from a gland in his esophagus to feed the chick. However, this is only temporary. If she does not return soon, he will have to abandon the chick to save his own life. When the mother comes back, she will have a full belly to care for her newly-hatched chick. She must continue keeping the chick warm with her brood pouch. If she doesn’t, the chick can die within minutes. By the time the ice at the breeding ground begins to break from the warmer temperatures, the young penguins are ready to swim and catch their own food. • They rely on vocal calls to identify one another. Their voices can be heard up to 0.6 miles away. 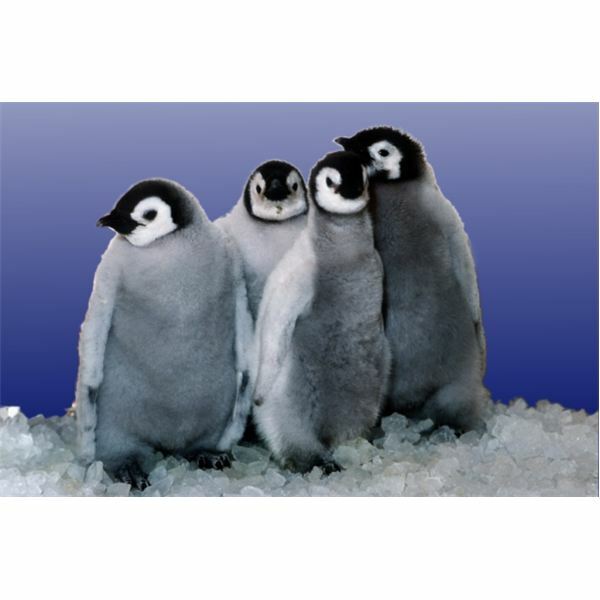 • On average, Emperor penguins in the wild can live up to 20 years. Some have been recorded to live over 40 years. • They are not listed as endangered. However, there are concerns about global warming melting the ice they breed on. Emperor penguins in Antarctica image courtesy of the National Science Foundation (in the public domain). 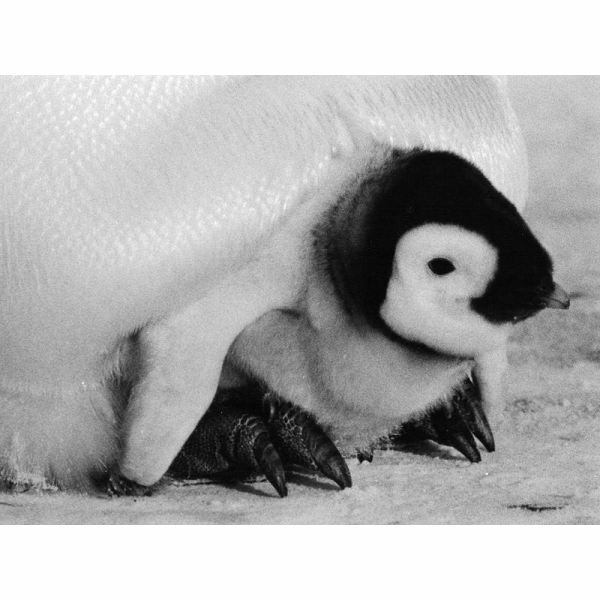 Emperor penguin and chick image courtesy of Mtpaley at Wikimedia. Emperor penguin chicks at Sea World image courtesy of Struthious Bandersnatch at Wikimedia.